Elevation data are essential to a broad range of business uses, including forest resources management, wildlife and habitat management, national security, recreation, and many others. In the State of Oregon, elevation data are critical for river and stream resource management; forest resources management; water supply and quality; infrastructure and construction management; wildfire management, planning and response; natural resources conservation; and other business uses. Today, high-density light detection and ranging (lidar) data are the primary source for deriving elevation models and other datasets. The Oregon Lidar Consortium (OLC), led by the Oregon Department of Geology and Mineral Industries (DOGAMI), has developed partnerships with Federal, State, Tribal, and local agencies to acquire quality level 1 data in areas of shared interest. The goal of OLC partners is to acquire consistent, high-resolution and high-quality statewide coverage to support existing and emerging applications enabled by lidar data. 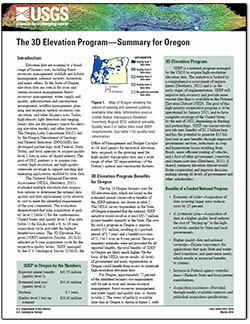 Carswell, W.J., Jr., 2014, The 3D Elevation Program—Summary for Oregon: U.S. Geological Survey Fact Sheet 2014–3014, 2 p., https://dx.doi.org/10.3133/fs20143014.